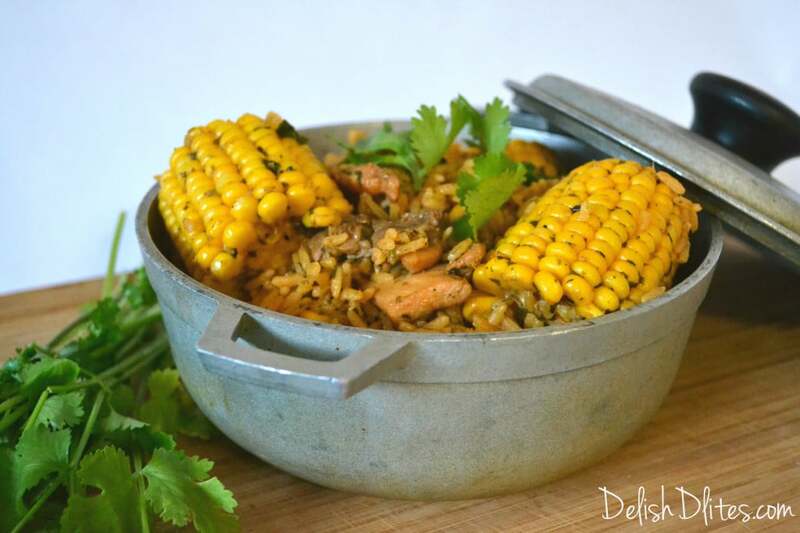 Arroz con pollo is one of the first dishes I learned how to make growing up in my mom’s Puerto Rican kitchen. It’s one of those dishes that can usually be whipped up on a moment’s notice, when there’s nothing else in the fridge except some chicken. Any kind of chicken will do, whether it’s legs, breasts, wings or thighs. I’m partial to chicken thighs, as they hold up well to long cooking times and don’t dry out like chicken breast can. My fridge isn’t always well stocked, especially when life gets hectic, but at the very least, I always have chicken and rice ready and waiting, and most ingredients in this dish are pantry staples, like adobo, sazon, tomato sauce/paste, sofrito, & dried spices. This aromatic, savory, one pot wonder is a great staple recipe to have in your culinary arsenal. The rice absorbs the highly seasoned, herbaceous broth to produce a fragrant and fluffy rice dish that satisfies all the senses. 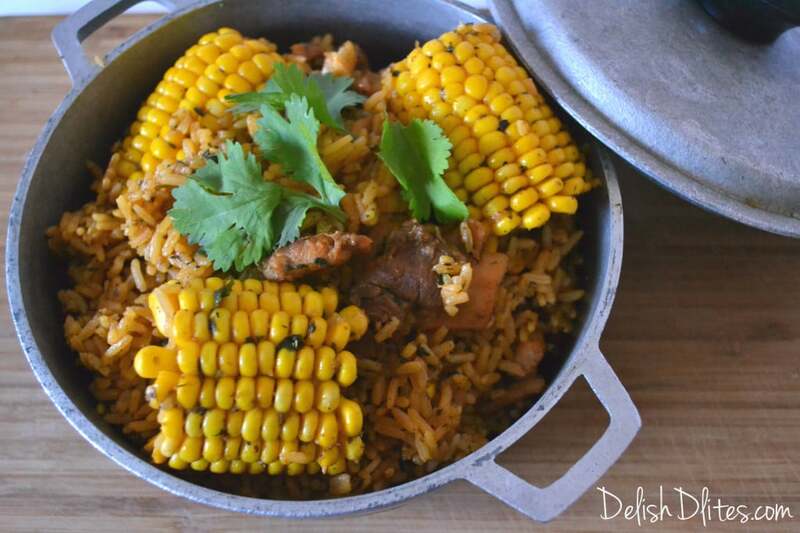 Whether you’re feeding family, friends, or a little bit of both, everyone loves arroz con pollo! 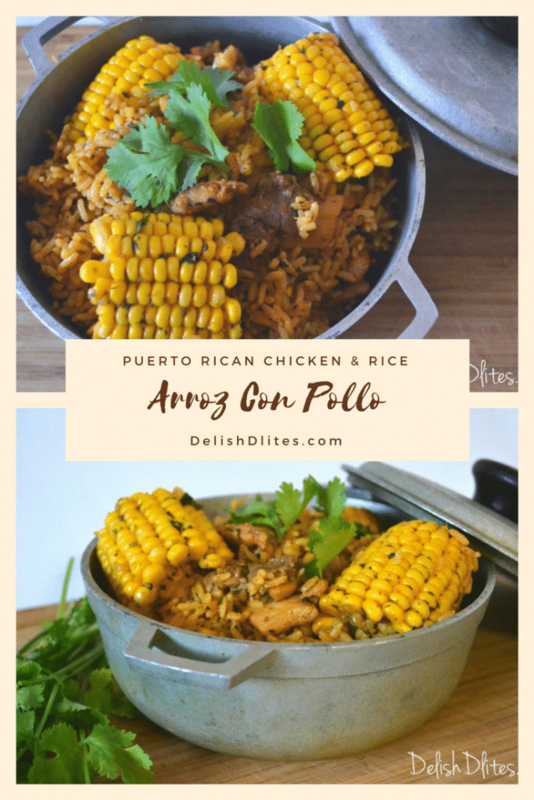 You can mix and match a million different additions into a basic arroz con pollo recipe; some of my favorite to add are canned beans, frozen peas, shucked corn, corn on the cob, or even a frozen vegetable mix. Preheat a caldero on medium heat. Cut up the chicken, and season with the adobo and cumin. Toss to coat. Add the sofrito into the pan, and cook for 1 minute, until fragrant. Stir continuously to keep it from burning. 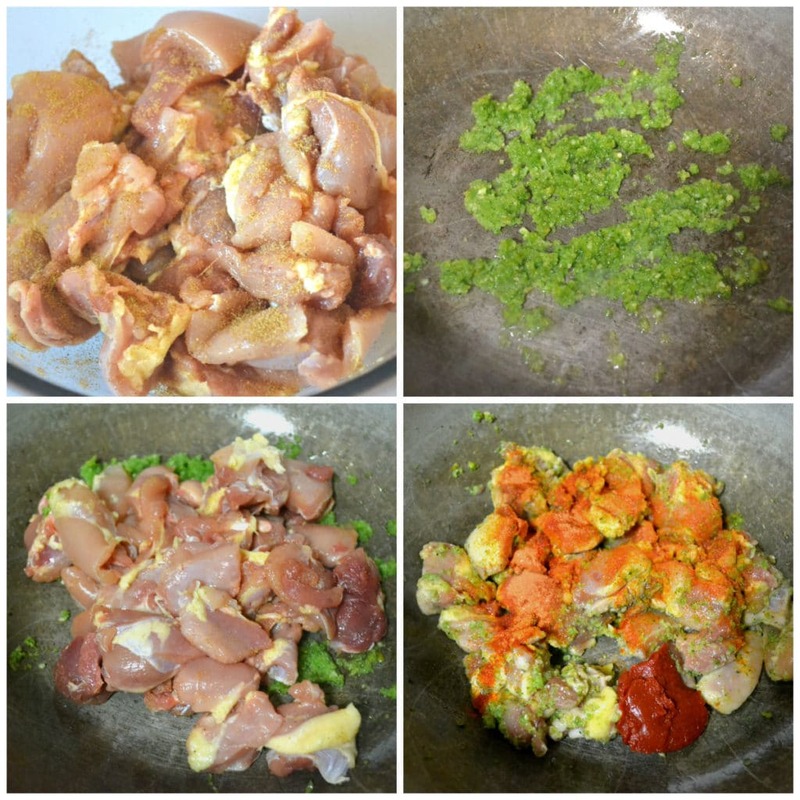 Add in the seasoned chicken, and toss with the sofrito. Add in the sazon and tomato paste, and toss again to coat, and to cook the raw tomato flavor out of the tomato paste. Next, add in the water or broth, powdered chicken bouillon, chopped cilantro, bay leaves and dried spices. Bring the mixture to a boil. Once it’s come to a boil, taste for seasoning. If it needs more salt, sprinkle in a bit more of the powdered chicken bouillon. Once the mixture comes to a boil, add in the rice, and stir to evenly distribute the rice. Nestle the corn cobs into the liquid, and cook on medium, without a lid, until most of the liquid has been absorbed. 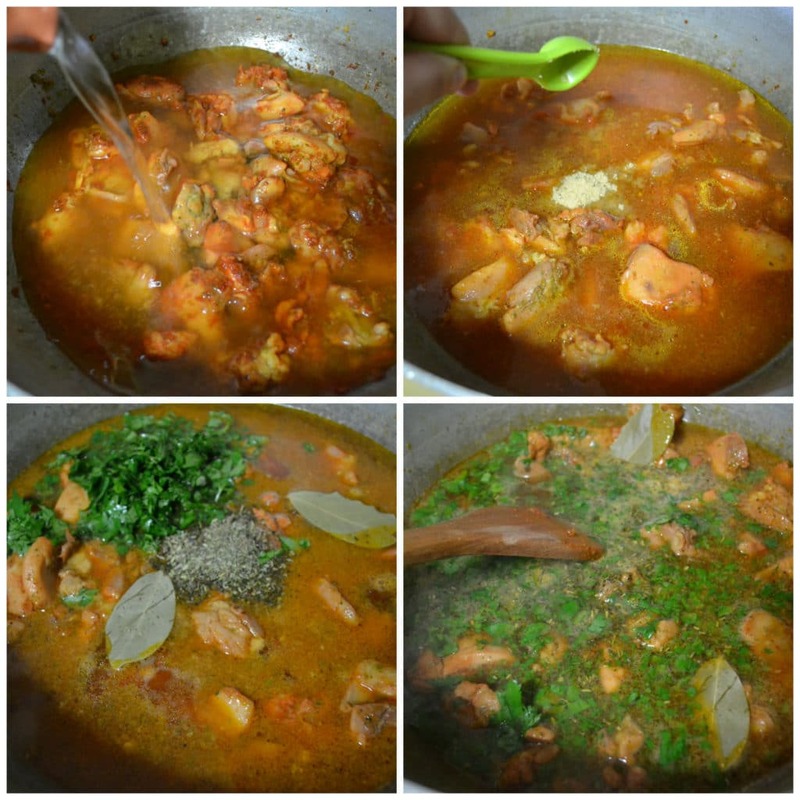 Once the liquid has been absorbed, use a spoon to mound the mixture into the center of the caldero, then cover and reduce the flame to a simmer. Cook for 25-30 minutes, until the rice is tender and fluffy. You can serve this up on its own, with a salad, some crunchy fried plantains, sweet plantains, sliced avocado, a chunky pico de gallo salad, the possibilities are really endless. Whatever you decide, one thing’s for sure, this will be delish! Next, add in the water or broth, powdered chicken bouillon, chopped cilantro, bay leaves and dried spices. Bring the mixture to a boil. Once it's come to a boil, taste for seasoning. If it needs more salt, sprinkle in a bit more of the powdered chicken bouillon. GIRL! I made this last night and it was SO GOOD! I love your recipes, especially the Latin ones. Keep up the great work! Thank you! 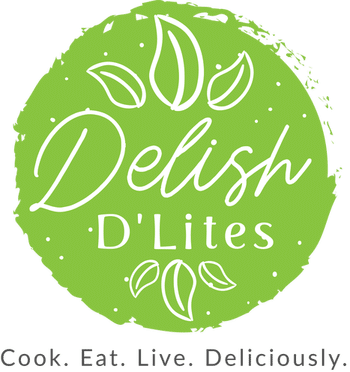 So glad you love the recipes!! 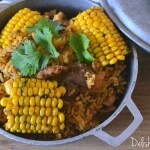 My ex mother was Puerto Rican, I wished I had paid attention when she cooked. I love the food. She did make 2 dishes I wonder if you know them, one with corned beef and one with these split peas in a bag that she somehow cooked and mashed and put them over white rice ? 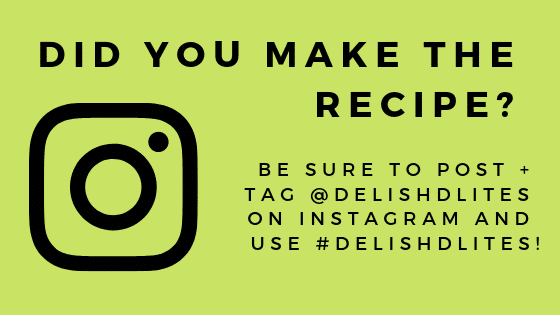 I have the corned beef recipe on my site, not sure about the other one! Just search corned beef in the search bar. Thanks . Is there a bread pudding also? Not yet. But thanks for the idea, I’m gonna work on that! I am African American and I just made this recipe. It is very delicious and it came out perfect. That’s awesome Hana! Glad you liked it! Hey Miki! Thank you SO much! That means the world to me! Buen provecho! LOVE, LOVE LATIN FOODS’!!!! GOIN’ 2 TRY, ALOT OF THM., IF NOT ALL!! THANK U SOOOO MUCHO!!!! Thanks so much Sis! Buen provecho!